Haq's Musings: Information Technology Jobs Moving From India to Pakistan? Outlook India recently ran a story headlined "Noida to Islamabad". It suggests at least anecdotal evidence of information technology jobs beginning to move from India to Pakistan. The number of jobs is only 125 but could it be the tip of a larger iceberg? Are western companies finding Pakistan becoming more competitive with India in terms of cost and skills on offer? Let's try and answer these questions. 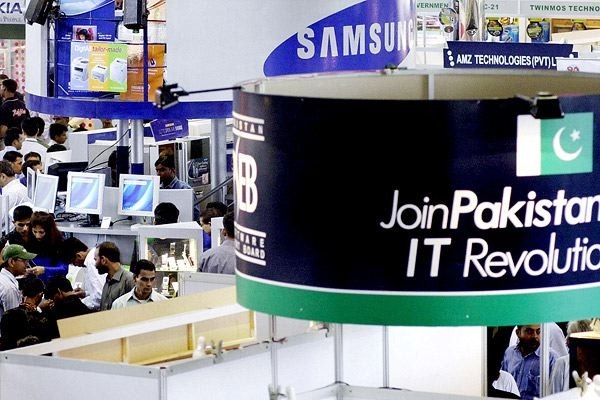 Recent move of 125 IT jobs from Noida to Islamabad in an indication that Pakistan is becoming an attractive destination for software and information technology companies looking for highly skilled talent at significant discounts. It is an emerging center of technology with at least two unicorns, Afiniti and Careem, engineered by Pakistanis in Pakistan. With growing numbers of young homegrown Pakistani technologists, a highly skilled diaspora and an evolving startup ecosystem with incubators, accelerators and investors, the country is beginning to demonstrate its vast potential as a vibrant technology hub of the future. Provincial governments, particularly those in Punjab and KP, are showing leadership in encouraging this trend. The main ingredients are all coming together to make things happen in Pakistan. Hi Riaz. Just wanted to update you. Since 11 months I am heading a federal government technology fund that has launched several projects including a network of world class incubators across the country, a program to train 1 million people in digital skills, and funding of 30 startups and tech development projects in 4th Industrial Wave tech like AI, IoT, Robotics, Implantables, Big Data, cloud infrastructure, cyber security. We also do studies which help introduce incentives like tax breaks for startups. Check us out at www.ignite.org.pk and at @igniteNTF on FB, Twitter and Linkedin. Let me know if you need further info. Yusuf: "Just wanted to update you. Since 11 months I am heading a federal government technology fund that has launched several projects including a network of world class incubators across the country, a program to train 1 million ......"
That's great. Would you like to write a guest post for my blog? I'll publish it under your name. My blog is widely read in US and Europe as well as in South Asia. Let me know. Would love to. Published 5 articles in national dailies over last few months on our programs. Will send you some links and also take a look at your blog again. The computer services exports of Pakistan have seen an increase of 32.11 percent during the first two months of the current fiscal year 2017-18, as compared to the last year, according to the report of Pakistan Bureau of Statistics (PBS). Pakistan has earned $111.38 million against the services worth $84.31 million during the period. During the past 4 years, IT Industry has contributed 98% to Pakistan’s economy by foreign exchange earnings, as stated by Minister for IT Anusha Rehman. IT industry in Pakistan is flourishing as Pakistan has earned $54.37m by exporting software consultancy services, showing growth of 69.22 percent as compared to exports of $32.126m last year. According to the data revealed by PBS, hardware consultancy services exports have also seen an increase of 144.41 percent to $0.72 million as compared to the last year’s export of $0.3 million of the same services. Similarly, the maintenance and repair services for computers also seen a slight increase of $0.39 million as compared to $0.23 million of last year, showing growth of 68.97 million. In general, the exports of the country have earlier seen a decline by 12% in the past fiscal year 2015-16, while the current fiscal year seems to get a boost by the export services of IT and Telecom sector. However, the trade of computer software services observed a negative growth of 1.01 percent during first two months, declining to $40.766 million this year from $41.181 million during the last year. However, the export of telecommunication services has not been a much success for Pakistan. The export of telecom services from the country decreased by 0.93 percent by going down from the trade of $63.43 million last year to $62.84 million during the current fiscal year. It must be noted that general services exports from Pakistan have seen an immense increase by 4.94 percent during the period under review while comparing to the same period of last year. With this considerable increase of $816.27 million of this year, compared to the exports of 777.84 million in last year, Pakistan is witnessing the great potential of its IT and Telecom sector in this era of digitalization. The exports of Information and Communication Technology (ICT) services and related sectors have registered a double digit growth of 14.5 per cent, surging to US $ 252 million during first quarter of this year. During same period of July to September 2016-17, the exports recorded in this domain were US $ 220.2 million. The statistics issued by State Bank of Pakistan have showed that local companies and startups related to Information Technology (IT) and similar sectors have continued to expand their market share in foreign market as value of exports recorded double digit growth. Pakistani companies usually export ICT services to United States, Middle East and North African countries. Major heads of exports included software and hardware consultancy, telecommunication services, call center services and export of software. In last financial year 2016-17, IT exports and related services touched nearly US $ 1 billion reaching an all-time high. It is expected that exports will cross the US $ 1 billion mark this year. According to Pakistan Software Exports Board (PSEB), Pakistan’s has been showing a healthy growth rate of IT & ITES exports in South Asia during the last three years. It grew by 71 per cent from June 2013 to June 2016. In last financial year as well, Pakistan’s IT and related services exports have grown at a faster pace than India and Sri Lanka. Pakistan’s growth rate during 2016-17 was 16 per cent whereas Sri Lanka was at 5 per cent. The statistics of IT services exports are usually labelled as remittances under IT sector but the industry strongly believes that overall exports are three times higher than the reported numbers which includes exports of services by freelancers and various IT services in different sectors such as financial and textile sectors. Accordingly, the exports of IT and related services stand US $ 756 million by end of first quarter of 2017-18, which will likely to touch a mark of US $ 3 billion as per estimates. With the fiscal deficit recorded at 1.2 percent of the gross domestic product (GDP), the federal government's financial operations and debt statistics for the first quarter of the current fiscal year (1QFY17) show strong performance and prudent expenditure. On one hand, the revenue collection — especially that from taxes — registered a strong growth of over 20 percent during 1QFY17, while, on the other, the government's domestic and external borrowings were kept under check, a finance ministry spokesperson said in a statement here Tuesday. The spokesperson stated that there were expenditure controls as well, which reflected on the prudent fiscal management and government's resolve to maintain this momentum in the remaining quarters of the year. Based on the actual data, the overall fiscal deficit during 1QFY17 was recorded at 1.2 percent of the GDP as opposed to 1.3 percent during the last year's corresponding period, the spokesperson added. He said the total consolidated federal and provincial revenue amounted to Rs. 1.025 trillion, which reflects an 18.9-percent increase over same period last year. The tax collection by Federal Board of Revenue (FBR) amounted to Rs. 765 billion — denoting a hefty growth of over 20 percent — while the non-tax receipts for the period amounted to Rs. 114 billion, which are also higher when compared to the same period, last year. The total expenditure during the period amounted to Rs. 1.466 trillion, of which the current and development expenditures were Rs. 1.241 trillion and Rs 0.221 trillion, respectively. The statistical discrepancy for the period July-September 2017 amounted to Rs. 4 billion compared to Rs. 38 billion during last year's same period. The spokesperson said the civil accounts data of the federal government's revenue receipts and expenditure in 1QFY17 was received from the office of Accountant General Pakistan Revenues (AGPR), financing data from Economic Affairs Division (EAD) — external financing — and from the State Bank of Pakistan (SBP). Likewise, the civil accounts data of the provincial government's revenue receipts and expenditure in 1QFY17 was received from the provincial Accountant General (AGs). He added that the deficit figure reported earlier was based on the SBP's daily cash balance reports, which did not include the financing on account of project aid and financing from National Savings Schemes. The financing from project aid was substantially higher on account of roads and infrastructure, he said. The spokesperson said around 47 percent of the budget estimates were received as project aid financing during July-September 2017 on that account. This has mainly been received during September 2017, while incremental receipts on account of National Savings Schemes have recently been reported by the SBP, he added. The federal government deposits with the SBP, he stated, also reduced during September 2017. Therefore, after including the aforementioned financing data, the overall fiscal deficit for the July-September 2017 period amounted to 1.2 percent of the GDP against 1.5-1.8 percent of GDP projected by some analysts. The spokesperson said a section of the media had drawn some premature conclusions on debt performance of the government based on the data for the first two months of the current fiscal year. He clarified that choosing to evaluate debt statistics based on two-month numbers was a flawed method that led to misrepresentation. He said as debt numbers from relevant agencies — such as Economic Affairs Division, Budget Wing, National Saving and State Bank — were received and consolidated for 1QFY17, it had become quite clear that the upwards bump in public debt was well below the analysts' forecasts. Even the current workers have cause for concern—to clamp down on visa fraud, the United States Customs and Immigration Services (USCIS) plans to double the number of visits to workplaces. “Indian IT companies, thus far champions of IT-based outsourcing, have been forced to go back to the drawing board in order to reposition themselves higher up in the value chain,” Anshul Prakash, a partner at Mumbai-based legal services firm Khaitan & Co, told Quartz. Tata Consultancy Services (TCS) and Infosys, two of India’s largest IT companies and once leaders in job creation, reduced their headcounts for the first time ever. Even mid-sized players like Tech Mahindra retrenched several employees. (However, TCS’s staff addition recovered after a fall during April-June 2017 and rose 0.8% in the following quarter). Compared to the normal rate of forced attrition (i.e. asking non-performers to leave) of around 1% in earlier years, 2017 saw Indian IT companies letting go of between 2% and 6% of their employees, said Alka Dhingra, general manager of IT staffing at TeamLease Services. Infosys cut 9,000 jobs in January. “Instead of 10 people, what if we have three people to work on (a project). If we don’t have the software, then some others will take the advantage (away from us),” Vishal Sikka, the former CEO of the Bengaluru-based company, said in February. Meanwhile, around 6,000 Indian employees at Cognizant reportedly lost their jobs to automation. Mumbai-based Tech Mahindra implemented a cost optimisation plan of increasing automation and reducing manpower. It turned ugly in July when the firm made headlines over a controversial audio clip that featured an HR personnel purportedly coercing an employee into quitting by 10am the next day, or risk being fired. .... Pakistan’s tiny IT sector is carving out a niche for itself -- so much so that it has been the subject of several stories in international publications such as the New York Times, the Global Post, Al Jazeera, to name a few. Perhaps the interest is because of the obvious potential of the industry: There are now 1,500 registered IT companies in Pakistan, and 10,000 IT grads enter the market every year. .....Naseeb Networks International, a Lahore-based company that runs the online job marketplace Rozee.pk, announced that it had won a third round of investments worth $6.5 million, from the European investment firms Vostok Nafta and Piton Capital. The latest round of funding brought the company’s total venture capital funding to $8.5 million. Further, the rise of the mobile software market has been a huge gamechanger. “Prior to the iPhone … it was a very closed-door system,” said Babar Ahmed, Mindstorm’s co-founder and CEO. “So you had to apply for a developer’s license to Nintendo or Microsoft or Sony. And they’d vet your studio out, they’d look at your resumes. They’d only give their [software development kit] to, like, very select studios. That’s not the case anymore” (as quoted in The Global Post). 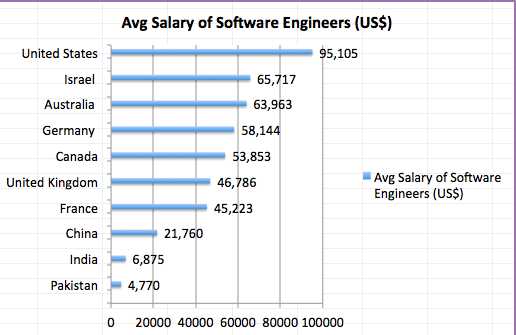 Hardware & networking jobs fetch about Rs 15 lakh per an .. software jobs fetch about Rs 12 lakh, and consumer jobs Rs 9 lakh.